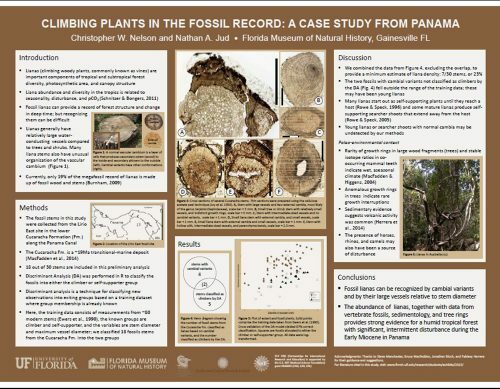 PaleoTEACH is a collaboration involving the Florida Museum of Natural History, Duke University and science educators. The goal is to create curricula using high-quality 3D models for a K-12 audience. 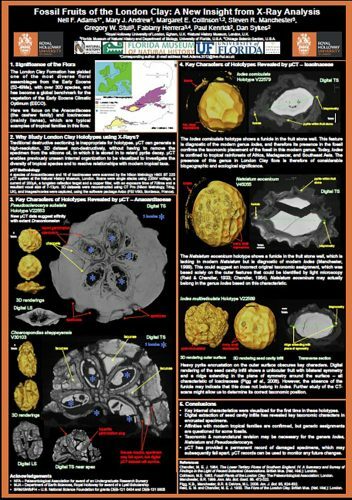 Fossils are oftentimes delicate or rare, and not universally suitable for classroom use. Therefore, 3D scanning and printing technology provides a unique opportunity to make these specimens available for K-12 education. 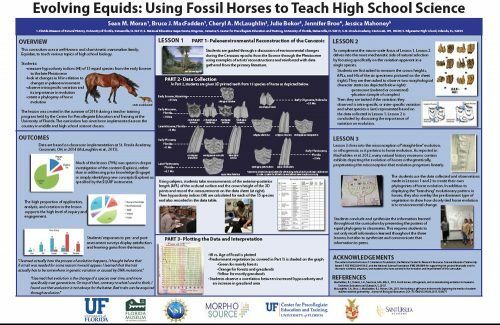 Paleontology is an interdisciplinary and engaging area of study that provides distinctive opportunities for STEM integration. STEM integration is an instructional method that aims to emphasize the connections between Science, Technology, Engineering and Math. The Paleocene–Eocene Thermal Maximum (PETM) is marked by a rapid negative carbon isotope excursion with an associated shift towards warmer global temperatures by ~5–10 °C. At least 40% of the measured mammalian genera in the Bighorn Basin (BHB) are smaller during the PETM compared to adjacent, cooler biochrons, suggesting a relationship between climate change and body size. To date, only stasis in shape between biochrons was documented. Within the PETM, size changes correlated with climate proxies have been documented in only one lineage (Sifrhippus sandrae) in the BHB, and changes in shape were not addressed. 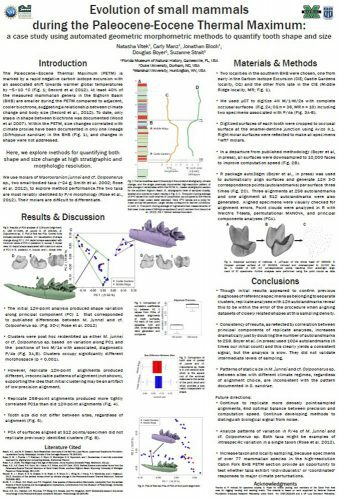 Here, we explore methods for quantifying both shape and size change at high stratigraphic and morphologic resolution. The lesson was created in the summer of 2014 during a teacher training program held by the Center for Precollegiate Education and Training at the University of Florida. The curriculum has since been implemented across the country in middle and high school science classes. The Paleocene-Eocene Thermal Maximum (PETM) was a significant global warming event that occurred 56 million years ago1, characterized by an increase of ~5-8 °C in mean annual global temperature. 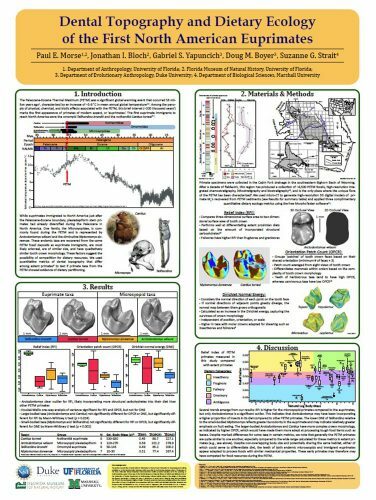 Among the panoply of physical, chemical, and biotic effects associated with the PETM, this brief interval (~200 thousand years2) marks the first appearance of primates of modern aspect, or ‘euprimates.’ The first euprimate immigrants to reach North America were the omomyid Teilhardina brandti and the notharctid Cantius torresi. 1Royal Holloway University of London, Egham, U.K.; 2Natural History Museum, London, U.K.; 3Florida Museum of Natural History and Department of Biology, University of Florida, U.S.A.; 4Chicago Botanic Garden, U.S.A. The London Clay Formation has yielded one of the most diverse floral assemblages from the Early Eocene (52-49Ma), with over 300 species, and has become a global benchmark for the vegetation of the Early Eocene Climatic Optimum (EECO). Here we focus on the Anacardiaceae (the cashew family) and Icacinaceae (mainly lianas), which are typical examples of tropical families in this flora. 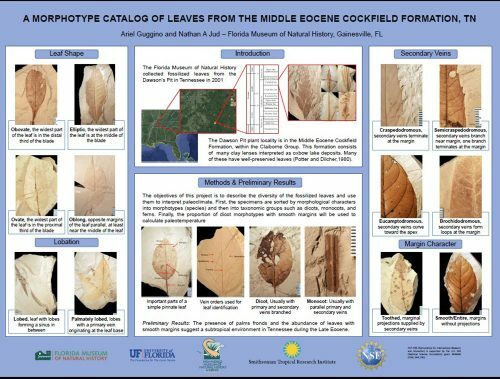 The Florida Museum of Natural History collected fossilized leaves from the Dawson’s Pit in Tennessee in 2001. The Dawson Pit plant locality is in the Middle Eocene Cockfield Formation, within the Claiborne Group. This formation consists of many clay lenses interpreted as oxbow lake deposits. Many of these have well-preserved leaves. 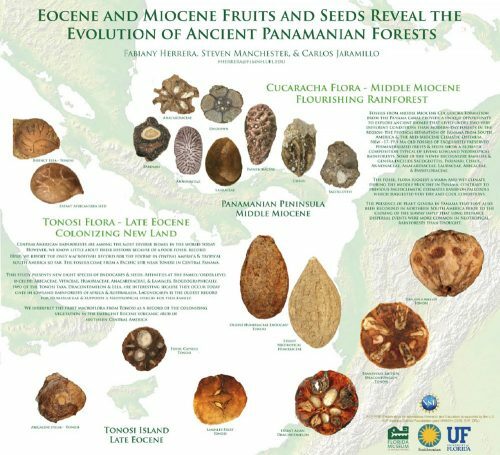 Fossils from Middle Miocene Cucaracha formation from the Panama Canal provide a unique opportunity to explore ancient biomes that lived under two very different conditions than modern-day forests in the region. Lianas (climbing woody plants, commonly known as vines) are important components of tropical and subtropical forest diversity, photosynthetic area, and canopy structure. Liana abundance and diversity in the tropics is related to seasonality, disturbance, and pCO2 (Schnitzer & Bongers, 2011). Fossil lianas can provide a record of forest structure and change in deep time; but recognizing them can be difficult. Lianas generally have relatively large water-conducting vessels compared to trees and shrubs. Many liana stems also have unusual organization of the vascular cambium. Currently, only 19% of the megafossil record of lianas is made up of fossil wood and stems (Burnham, 2009).